Standing outside in the elements all night in order to pick up the latest iPhone is surely one of the great traditions of Apple fandom. And if you're inclined to do so for the upcoming iPhone X, Apple is actively encouraging you. 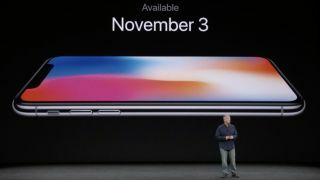 According to an announcement on Apple's website, the new phone will be available for walk-in customers in 55 countries on Friday, November 3 at 8am local time. You're "encouraged to arrive early." But if you don't feel like standing outside and getting pelted by rain or possibly snow overnight, you'll be happy to know that pre-orders for the hotly anticipated smartphone will go live this Friday, October 27, at 12:01am PT / 3:01am ET / 8:01am GMT / 6:01pm AEST. You can pre-order through either the Apple Store app or via Apple's website. Keep in mind, though, that reports currently claim that only around two or three million iPhone X units will be available at launch, so those pre-orders might be filled before the page even loads for you. Standing outside could end up being a better idea than it initially seems, depending on where you are. It'll be interesting to see how this plays out. Apple's uncommon strategy of releasing two widely different types of smartphone this year appears to have led to comparatively modest interest in the new iPhone 8 and iPhone 8 Plus. Both phones boast some nice features, but they're basically mere iterative improvements over last year's iPhone 7 and iPhone 7 Plus. In any other year, we may have been calling the iPhone 8 the iPhone 7s. Last month we even told you that it just doesn't make sense to buy the iPhone 8 Plus. The iPhone X (pronounced "ten"), though, is likely the device the Apple faithful have their eyes set on. It's difficult to say how distracting the "notch" atop the otherwise phone-length screen will prove, but the iPhone X is packed with plenty of other neat features. There's the new "Face ID," for one, which replaces Apple's familiar home button (RIP) with a facial recognition system involving 3D cameras and infrared scanners. Other goodies include Apple's first smartphone OLED screen, support for wireless charging (which you'll also find on the iPhone 8 units), Apple's impressive A11 "Bionic" chip and dedicated support for augmented reality apps. CES 2018 is fast approaching!